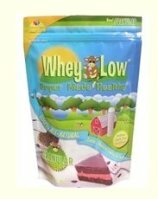 Whey Low is a sweetener that is made form three sugars: fructose, lactose and sucrose. It's promoters make great claims for it. - They say it tastes great, is low in calories and has a low glycemic index. This seems strange as it is merely a mix of three ordinary sugars. Dr. Zehner, the person who developed this product, claims that the combination of sugars interfere with the metabolism of each other, and consequently they pass through the digestive tract without being absorbed fully. No doubt about it Whey Low tastes great. In fact it tastes exactly like sugar, and this is no surprise as it is exactly sugar. It also cooks, bakes and browns just like ordinary table sugar. It has the same sweetness and can be used spoon for spoon as a replacement. A quick check on the Amazon customer reviews is a great way to get the lowdown on general feedback. Many people were delighted with this product, since it tastes great, browns well, and has a guilt free feel about it. However, worryingly, some diabetics who carefully monitored their blood sugar, found it rose significantly after consuming it. Others didn't, however this may be down to the fact that Whey Low is mostly fructose. It may be also down to the fact that people react in a very different way to it. The bottom line is that it is mainly fructose, and that of itself is enough to get the alarm bells ringing. Here is a very good link to Dr Mercola's website and his view on the effect fructose has on health. There may be some truth to the claims that the mix of three sugars interfere with the body's ability to metabolize them together. But the way foods interfere with each other is a very complicated thing, and can vary hugely from person to person. Pure crystalline fructose is a very harmful substance, potentially much more detrimental to health than ordinary sugar. Is it worth taking the risk? In my view no. You don't want any refined fructose in your diet, and if you value your health then it would seem sensible to give this product a miss.